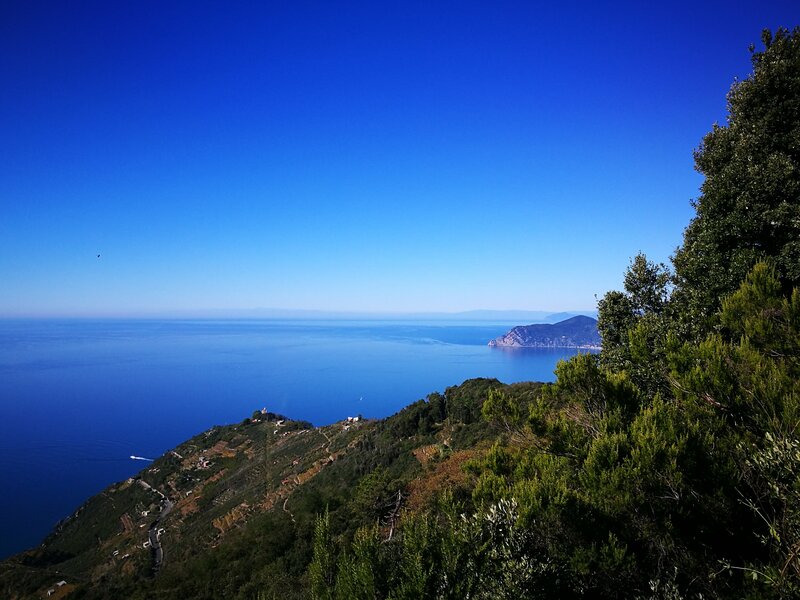 October 14, a new appointment with the series of walks in Liguria in the territory of La Spezia, organized by DoInItaly with Spezzino Vero and the Pennato Guides: to discover the cliffs overlooking the sea of Muzzerone. The white glow of the Muzzerone wall stands out on the Riviera between Portovenere and the Cinque Terre. But with the name Muzzerone, perhaps of Etruscan origin, we identify a wider area of hills and cliffs that in Roman times were crossed by a road, called in fact “Etruscan". The route started from Le Grazie to reach Sella Derbi, join the small settlements of the Tramonti to half-way up and go up to the hamlets around Montenero, roughly along the current Via dei Santuari towards Genoa. Our walk to Muzzerone starts following this track. Book your experience, limited seats. Is it possible to see the whole world in one glance? How you do it? According to the English naturalist F. W. C. Trafford yes: in 1869 he told of having had this extraordinary vision, called Amphiorama, right from Monte della Castellana, a height with an unparalleled view of the islands of the Gulf of Poets and the cliffs of Muzzerone. Nobody believed the story of the scholar, yet it remains fascinating, it is worth trying! So the locals call the golden grapes of the first rows facing the sun, the best, those to which to entrust the success of the so-called “reinforced" wine (do not ever call it Sciacchetrà, although the winemaking process is very similar). 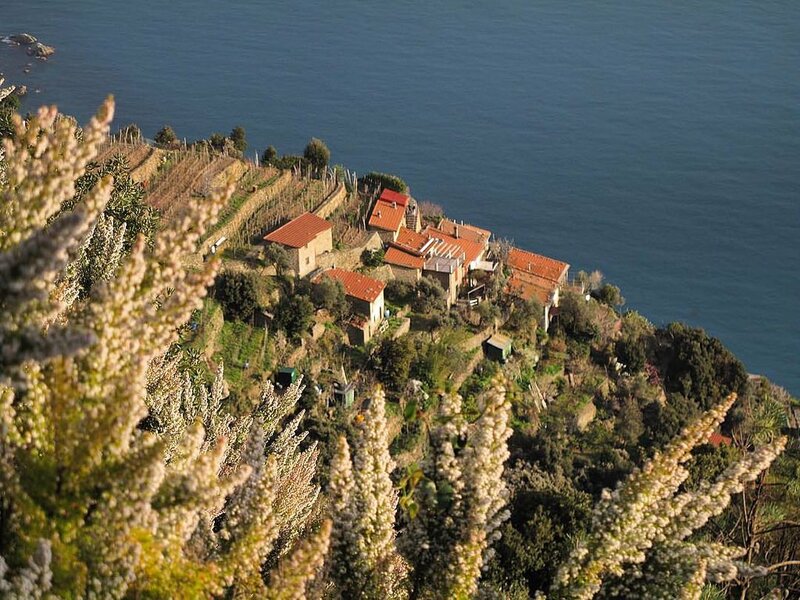 In the terraces of Persico, Albana, Chioso, Schiara, traditionally inhabited during the periods necessary for viticulture operations, we walk embracing a panorama of sea and land that defines in its superb hardness the shy and laborious nature of the ancient Ligurian populations, even if Campiglia’s population is told to have descended from Arab exiles fleeing after the defeat of the Crusades around the year 1000. Houses in Schiara on the Tramonti crest In Campiglia, the refreshment and suspended hammocks on the breathtaking panorama of the Piccoloblù mark the half of the route, which from here returns to the Muzzerone. Mandrachia is a portoro marble quarry, a typical local dark-colored rock that has been extracted here since Roman times, located under the heights of Muzzerone. An unprecedented place for an aperitif based on local wine to be enveloped by the sunset and the unique atmosphere of these places. Itinerary on marked trails and mule tracks. Tickets: Via Rattazzi 32, La Spezia, Monday to Friday from 9.00 to 13.00 (or other times on request). By purchasing online, you will receive an e-mail confirmation of your booking at the time of purchase. Book your experience, limited availability. La Spezia, one of Charles Dickens’s "Pictures from Italy"